The Tremeloes originally formed in 1959 as a 5 piece when the number of rock groups could be counted on one hand but having acquired two electric guitars and an electric bass guitar, made them almost unique. 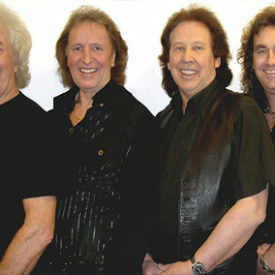 Before the start of their recording career, The Tremeloes toured extensively and gave over 200 broadcasts for the BBC. In 1962 they auditioned for Decca Records, the very same week as The Beatles. Decca signed The Tremeloes to a 3 year deal and turned The Beatles down (this is a fact that is still reported in all Beatles biographies). Ironically, they shared the Top 3 and the same song when The Tremeloes had their first hit with Twist And Shout . They also appeared on the same bill with The Beatles on several occasions! Following their first hit came 7 more major chart achievements including: Do You Love Me , Someone, Someone and Candy Man . After which they decided, mainly through musical differences, to part company with front man Brian Poole and work as a 4 piece. The band went on to score a further 19 hits to achieve a staggering 27 Hit Records!!! The Tremeloes name became known throughout the world and having appeared at every major venue in the world, the bank opened up many new territories for British talent. After the success of a song called Yellow River (which sold over 9 million copies and was a world-wide no. 1) where The Tremeloes had acted as producers and session band for a young singer called Jeff Christie, they decided to stop doing live shows for a while. The next period saw each member doing his own thing in different areas of the music business but they drifted back together to form, what can only be described as, one of the most powerful exciting bands performing live music on stage today. 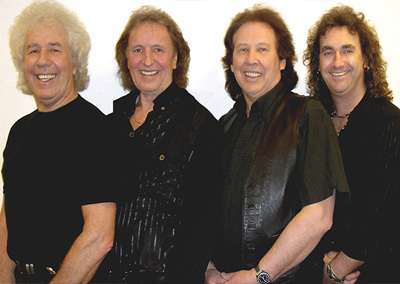 In their time, The Tremeloes have appeared with all the greats including, The Beatles, The Rolling Stones, The Who, Jimi Hendrix and many more of whom they count as friends today. Elton John still attends the band’s shows whenever he can. The Tremeloes live performing success must certainly be credited to the sound created by professional musicians who have “Done their time” to enable them to play rock music as only a 50’s or 60’s band can and to appeal to an audience of all age groups as they most certainly do, world-wide! The 2 original Tremeloes can still be seen today, putting their heart and soul into every live show with Dave Munden on drums and lead vocals and Rick Westwood on lead guitar with Davey Freyer on bass guitar and lead vocals and Joe Gillingham on keyboards and vocals, The Tremeloes line-up is complete to bring their unique sound into the 90’s and beyond, performing to hundreds of thousands of people every year all over the world.